Madrona Gallery thrilled to announce Pulp and Process III, our third annual show celebrating the diversity of works on paper. This group exhibition explores paper's many uses, from sketches, drawings and paintings on paper to photography and collage. In this year's Pulp and Process, we draw special attention to internationally recognized and award-winning photographer Diana Thorneycroft. On exhibition will be selections from Thornycroft's Group of Seven Awkward Moments and Canadians and Americans: Best Friends Forever / It's Complicated series, both of which deconstruct tropes of national identity and question the role of the wilderness in the collective national imagination. This year's Pulp and Process will also showcase works by Meghan Hildebrand, Pudloo Samayalie Nicotye Samayualie, Tamara Bond, Michael Nicholl Yahgulanaas, Hashim Hanoon, Morgana Wallace, Barry Hodgson and David Antonides. The show will run from January 13-27, with an opening on Saturday, January 13 from 1-4 pm. Join Michael Warren and the rest of Madrona Gallery in Victoria as they celebrate 5 years with a group show of Canadian Artists. Madrona Gallery is an historic and contemporary fine art gallery serving the community of Victoria and the surrounding area. The Gallery showcases art from both established and emerging Canadian artists to local and international visitors to Victoria. Madrona Gallery prides itself on providing a welcoming environment to new and established art collectors alike. Join us in celebration our 5th anniversary representing Canadian artists in Victoria, BC. 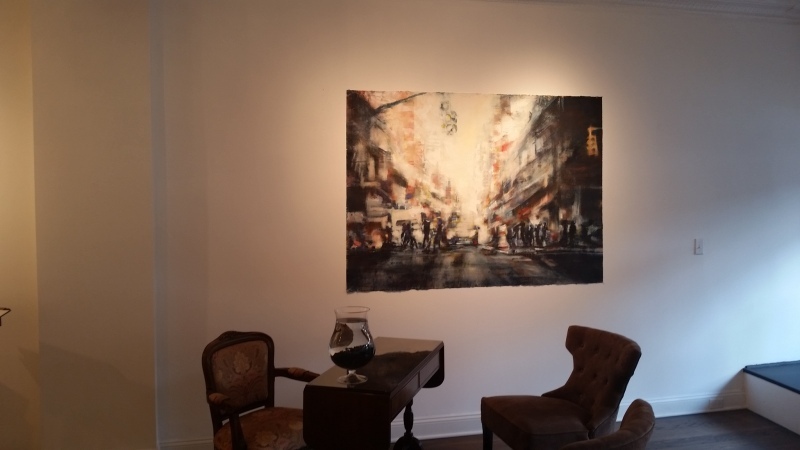 Over the last five years we have worked hard to showcase art from both well established and emerging Canadian artists and offer a welcoming environment to new and established art collectors alike. This group exhibition will feature new works from artists in our stable including Luke Ramsey, Meghan Hildebrand, Morgana Wallace, David Antonides, Megan Dulcie Dill, Corrinne Wolcoski and Rick Bond. The opening for SPECTRUM was documented in a video by Maria Theresa and Art in Motion. Show continues in January 2017. ART GALLERY 345 on December 15th, 2016 will host an exciting opening and an impressive show of large-format watercolor paintings! The ARTERY gallery guide for Berlin has published an article on my work showing at Galerie Christine Knauber written by Doris Heidelmeyer. Wer ihm bei seiner Arbeit über die Schulter schaut, sieht David Antonides nicht nur mit Pinsel: Man sieht ihn kratzen, sprühen, wischen und schaben. Die Dynamik in seinen Arbeiten entsteht durch ein vielschichtiges Procedere auf dem Medium Papier, was, wie es Antonides Arbeiten zeigen, robuster und flexibler ist als man denkt. Beobachten lässt er sich bei dieser künstlerischen Arbeit gerne. Seine Produzentengalerie ist ein offener Ort und versucht ein Bindeglied zwischen der Kunst und den Menschen, die in der Brunnenstraße unterwegs sind, zu sein. David Antonides, der kanadische Künstler aus Vancouver kam vor sechs Jahren: Er wollte nur ein paar Wochen bleiben. Die Stadt hat ihn gefesselt, sie hat es ihm leicht gemacht und er ist geblieben. Er hat sich schnell hier etabliert. Dieses Jahr wurde er für drei regionale Kunstpreise nominiert, aber die Metropolen New York und Vancouver hat er nicht aus den Augen verloren. So bleiben neben Berliner Stadtlandschaften, urbane Szenen der Metropolen im Focus seiner großformatigen Arbeiten. Aber David Antonides kann auch in kleinen Arbeiten, wie seinen Monotypien und Radierungen, die urbanen Eigenheiten herausstreichen. "Sie mystifizieren weder die unwirtlichen Schattenseiten, noch glorifizieren sie den berauschenden Glanz (der Metropolen). ", meint Christine Knauber, die Antonides Arbeiten bereits in ihrer kleinen und charmanten Galerie "30links" zeigte. Seit 10 Jahren ist Christine Knauber Galeristin und im letzten Jahr hat sich ihre erstrangige, professionelle Arbeit mit ihren Künstlern in einer größeren Galerie manifestiert. Die "Christine Knauber Galerie" ist nun in großzügigen, hellen Galerieräumen in der Langenscheidtstraße in Schöneberg angekommen und kann bereits im Dezember ihren ersten Geburtstag feiern. Christine Knaubers aktuelle Ausstellung ist ihre erste "Salon-Ausstellung" in diesen Räumen. Sie knüpft an Berliner Traditionen an und zeigt über 80 Arbeiten von 16 Künstlern. Die Arbeiten von David Antonides, die der Salon Nr. 1 zeigt, hat Christine Knauber in langen Atelierbesuchen ganz gezielt ausgesucht. Sie will die verschiedenen Facetten von David Antonides Arbeit zeigen und hat kleine, fast monochrome Monotypien ausgesucht, aber sie zeigt auch die großformatigen, mit wasserlöslichen Pigmenten gemalten Arbeiten. Gefragt was sie an den Arbeiten besonders schätzt, weist Christine Knauber auf den Geist der Arbeiten hin: "Ihn fasziniert das urbane Wesen in seiner Gesamtheit: der Charakter einer Stadt, ihr Klang, ihre Farben, ihr Rhythmus, ihre Seele. In seinen Werken verschmelzen Architektur und Menschen zu einem flirrenden urbanen Organismus. Man spürt förmlich die Rasanz und Kraft jener Mega-Cities in seinem expressiven Farbauftrag. Zarte Linien, pastellige Töne und verschwommene Konturen verraten aber auch etwas von ihrer Schönheit und Poesie." Bis zum 11. Februar 2017 kann man die Arbeiten von David Antonides noch in Schöneberg in der Galerie Christine Knauber sehen. Anyone who looks over David Antonides' shoulder while he is working, will not only see him with a brush: you can see him scratching, spraying, wiping and scraping. The dynamic in his works is created by a multi-layered process on the medium of paper, which, as Antonides shows, is more robust and flexible than one might think. David Antonides, the Canadian artist from Vancouver came six years ago: he just wanted to come for a few weeks. The city fascinated him and made it easy for him, so he stayed. He quickly established himself here. This year he was nominated for three regional art awards, but he never lost sight of the cities of New York and Vancouver. In addition to Berlin's urban landscapes, urban scenes of the large cities remain the focus of his mostly large-scale works. But David Antonides also produces urban features in smaller, more filigree works, such as his monotypes and etchings. "They do not mystify the inhospitable aspects of the world, nor glorify the intoxicating splendor (of the cities)," says Christine Knauber, who already exhibited Antonides works in her small and charming gallery "30links". Christine Knauber has been gallery owner for 10 years and last year her outstanding professionel work condensed in a larger gallery. The "Christine Knauber Galerie" has now arrived in generous, bright gallery rooms in the Langenscheidtstraße in Schöneberg and can already celebrate its first birthday in December. Christine Knauber's current exhibition is her first "Salon Show" in these rooms. It draws on Berlin traditions and shows over 80 works by 16 artists. The work of David Antonides, which she shows in Salon No. 1, has been selected by Christine Knauber during long studio visits. She wants to show the different facets of David Antonides' work and chose small, almost monochrome monotypes, but she also shows the large-scale works painted with water-soluble pigments. Christine Knauber, who is particularly interested in the work, points out the spirit of the works: "He is fascinated by urban nature in its entirety: the character of a city, its sound, its colors, its rhythm, its soul. The architecture and the people melt into a fluttering urban organism, you can feel the speed and power of those mega-cities in his expressive color application. But the delicate lines, pastel tones and vague contours also reveal some of their beauty and poetry. " Until February 11, 2017, the work of David Antonides can be seen in Schöneberg at Galerie Christine Knauber. The salon has always been a place of wonder, inspiration, a place of diversity and novelties. Salons were, however, also a meeting place for free spirits, who were looking for exchanges with their peers, and were delighted to do so in an artistically stimulating atmosphere. In this tradition the Galerie Christine Knauber will be transformed into a salon. In the coming months you can see more than 80 works by well-known and new artists - presented in a lush Petersburger-style presentation. The artistic handwritings, subjects and techniques are as varied as they must be in a drawing room, the focus being on drawing and printing graphics. For this, there will be a event program in the coming months, which will fill the salon concept with further life. "Salon Nr. 1" is the start of a series of exhibitions whose format will be continued in the future. I would like to invite you and your friends to this Berlin exhibition. Der Salon war stets ein Ort zum Staunen, zur Inspiration, ein Ort der Vielfalt und der Novitäten. Salons waren aber auch ein Treffpunkt freier Geister, die Austausch mit ihresgleichen suchten und Freude daran hatten, dies in einer künstlerisch anregenden Atmosphäre zu tun. In dieser Tradition verwandelt sich die Galerie in den nächsten Monaten in einen Salon. Zu sehen sind über 80 Werke Ihnen bekannter und auch einiger neuer Künstler – präsentiert in einer üppigen Petersburger Hängung. "Metropolis" - Book project continues to exhibit in Portugal, Italy, Germany and Brazil this year. I am happy to celebrate this anniversary with Artworks with an opening and congratulations to Deanna and her staff. There is a special exhibition to be mounted for this event and continues into next year. Madrona Gallery is pleased to present its seventh annual Colours of Summer group exhibition. This show will feature a range of historic and contemporary works by the Madrona stable of artists and will include painting, drawing and sculpture. The show will continue to evolve throughout the summer as new works are hung, each embodying the spirit of the season. Featured artists include: Clayton Anderson, David Antonides, Shuvinai Ashoona, Nicholas Bott, Rick Bond, Karel Doruyter, Hashim Hannoon, Meghan Hildebrand, Barry Hodgson, John Lennard, Tim Pitsiulak, Ernestine Tahedl, Ningeokuluk Teevee, Corrinne Wolcoski and Sean Yelland. RBB television was in Galerie Brunnen64 for an interview. It was shown as part of the program ZIBB. The program is reporting on changes in Brunnenviertel (the Brunnen quarter of Berlin). In den vergangenen Jahren hat sich das Bild der Brunnenstraße gewandelt - von der Schmuddelecke zur Galerienmeile. Nach und nach zogen Künstler und Galeristen hierher, drum herum haben sich Cafés, Modelabels und andere Läden angesiedelt. Neuestes Event: Ein Streetfood-Market, der jeden ersten Sonntag im Monat in der Brunnenstraße/Ecke Bernauer Straße stattfindet. Hier sollen sich Menschen aus dem Kiez treffen, regionale Lebensmittel und internationale Küche werden angeboten. Ein Rundgang durch das lebendige Brunnenviertel. My main interest is in urban scenes, such as groups of people meandering in the streets, surrounded by the monumental architecture of cities like New York, London, or San Francisco. Taxi cabs are crowding the view up to the horizon. There are frenetic and still moments of pedestrians and parks. When I explore these themes of nature and urban experience, I look for opportunities to apply an expressionist eye to our common and unique views of the city. I work very physically on a large format paper surface using dense and transparent water-based pigments. This helps me to realize the varied impressions of the light and dynamics of the city that we live, feel, and see. A view of David’s studio. The best advice came from my great teachers at the Art Students League in New York. Among these gems was a statement from Sherry Camhy. I was working on a large composition on paper which could not be corrected in the event of a mistake. I hesitated to make bold and spontaneous marks and she advised, “It is better to be dead wrong than tentative.” This helped me later to often jump in and fail or succeed or perhaps just learn something new about the materials I work with. I prefer to change my environment often. I find it stimulating to work with sounds from the environment whether it is music or street noise or chatter. Recently, I am listening to podcasts of interviews surrounding culture such as “Writers and Company” by Eleanor Wachtel, “Fresh Air” on NPR, or “Ideas” on CBC. In the past I have had classic movies playing in the background and have listened to diverse music playlists given to me by other artists. I am very glad I don’t have to make this choice. To select to be in one state of mind or have one idea would be an unimaginable prison. Variety and change are important things for me in life and in art and I unfortunately do not know of a single piece that could fulfill all of these needs. I suppose that is why most collectors form collections instead of acquiring a single piece that defines them or their aesthetic. In the past I have enjoyed Rabindranath Tagore, Haruki Murakami, Jalal ad-Din Muhammad Rumi and classic western literature such as Camus – now I find I am largely interested in autobiographies of all sorts- in print and other media. Today, we have so much to draw from and to be distracted by. A few of the artist’s works on display in public. This is great stuff. Im gkad i got the opportunity to view as your work was previously unfamiliar. How do you get such large pieces through doors? This year we are celebrating with a show of Lithographs at the BBK Printworkshop at the historical Bethanien in Berlin. It is a good cross-section of work curated and organized by Klaus-Peter Vellguth who is a litho-printmaker now for over 30 years. I am again cooperating with artist Carole McDermit along with Broadfoot and Broadfoot Galleries on this show of urban-based work at 155 Orchard St on the Lower East Side in New York. New work and new context - I hope you will find an opportunity to visit the gallery and view this show until November 29, 2014. I am again cooperating with artist Carole McDermit along with Broadfoot and Broadfoot Galleries on this show of urban-based work at 155 Orchard St on the Lower East Side in New York. New work and new context - I hope you will find an opportunity to visit the gallery and view this show until November 29, 2014. Everybody knows, this vague, volatile situation between here and there, that space that opens up when you leave your place in order to achieve a goal. That stage between origin and arrival is often perceived as a gray area. And yet this is one of the most intense forms of existence, because it involves movement, change, decision, and even growth. A transit is often uncomfortable, but necessary if youwant to progress. A transit is a transition in which one looks forward - and sometimes back. The theme of "Transit" was not chosen by chance, because after nine years in the Solmsstraße this will be the last exhibition in Fachwerkhof. In the coming year you will find the gallery elsewhere in a new context. "Transit" is a farewell, but also a departure. I am delighted that many artists who have exhibited over the years at 30 LINKS accompany us on this step. Some work was explicitly created for this exhibition. They show that a transit can not only mean a journey from A to B, but ultimately can be as diverse and multi-layered as life itself. The exhibition is opening on Saturday, October 11, at 7 clock, I would like to invite you and your friends very much! We all look forward to this final celebration in the beautiful Fachwerkhof! Jeder kennt sie, diese unbestimmte, flüchtige Situation zwischen dem Hier und dem Dort, jenem Zwischenraum, der sich auftut, wenn man seinen Standort verlässt, um ein Ziel zu erreichen: sei es eine Reise oder eine Entwicklung geistiger, emotionaler Art. Jenes Stadium zwischen Herkunft und Ankunft wird oft als Grauzone empfunden. Und doch handelt es sich hierbei um eine der intensivsten Formen des Daseins, denn sie beinhaltet Bewegung, Veränderung, Entscheidung, ja sogar Wachstum. Ein Transit ist oft unbequem, aber notwendig, wenn man nicht stehenbleiben will. Und ein Transit ist immer ein Übergang, bei dem man nach vorne schaut – und manchmal auch zurück. Das Thema »Transit« wurde nicht zufällig gewählt, denn nach über neun Jahren in der Solmsstraße wird dies die letzte Ausstellung im Fachwerkhof sein. Im kommenden Jahr werden Sie die Galerie an anderer Stelle in einem neuen Rahmen wiederfinden. Insofern ist »Transit« ein Abschied, aber auch ein Aufbruch. Ich freue mich sehr, dass viele Künstler, die über die Jahre bei 30 LINKS ausgestellt haben, diesen Schritt mit ihren, teils explizit für diese Ausstellung geschaffenen Werken begleiten. Sie zeigen, dass Transit nicht nur eine Reise von A nach B bedeuten kann, sondern letztlich so vielfältig und mehrschichtig ist wie das Leben selbst. Zur Ausstellungseröffnung am Samstag, dem 11. Oktober, um 19 Uhr, möchte ich Sie und Ihre Freunde ganz herzlich einladen! Freuen wir uns gemeinsam auf einen heiteren Schlussakkord im schönen Fachwerkhof! September show at Broadfoot and Broadfoot Gallery in New Jersey. "My Boonton gallery for the month of September will show the new works of David Antonides. This body of work features 10 watercolours. My two favorites being Morning Crossing and Fortunate, they capture the energy and activity of city life. The scale of several pictures is quite large for this medium, 6’ x 4’, on paper, they are powerful and dynamic. We have called it aufgekratzt und tiefgedruckt which could be translated as scratched-out and hard-pressed. It is a nice cross-section of what is possible and happening now in copper-plate etching and experimental techniques. When paintings leave the studio they take a life of their own. From time to time I hear back from them in varied and surprising ways. permission release is requested. In April there are 4 paintings airing in two shows. Paintings of New York and New Yorkers on "Extreme Homes" on the HGTV Network, the exact airing date has not been announced. The HGTV series called "Extreme Homes" has been filming some of the most unique homes all over the world. They have filmed a house that contains three of my paintings. This house is in England and is a surprising and unique one. In der ersten Ausstellung des GASAG Kunstraum präsentieren wir drei in Berlin lebende Künstlerinnen und Künstler, die sich auf unterschiedliche Weise dem Thema „Berlin und das urbane Leben“ nähern. Unter dem Titel „Transmetropolis“ präsentieren wir einen visuellen Transit mitten durch die Großstadt – jenseits der touristischen Routen und der im Gedächtnis haftenden Postkartenmotive. Es sind die täglich millionenfach frequentierten Passagen, die Stationen der Tram, der S- und U-Bahn, die kleinen Nebenstraßen mit ihren Mietshäusern, aber auch die intimen Ecken urbanen Lebens. David Antonides, Anke Jungbluth und Marcel Teske zeigen dem Betrachter ihren subjektiven Blick auf einen persönlichen Spaziergang durch Berlin. Dabei eröffnen sich bisher ungesehene Perspektiven, die überraschende Schlaglichter auf die Stadt werfen. Die Arbeiten der Künstler und Künstlerin präsentieren Berlin als eine offene Stadt, die sich immer neu erfindet und nur schwer auf einen Nenner zu bringen ist. David Antonides, 1958 in Whitehouse (Kanada) geboren,lebte u.a. in Vancouver, New York und London. Seit 2010 hat er sich in Berlin niedergelassen. Als Kosmopolit ist die Großstadt zum Gegenstand seiner künstlerischen Auseinandersetzung geworden. Von flirrender Unruhe erfasst, verschmelzen Menschen und Architektur in seinen Bildern zu einem unentwirrbaren urbanen Organismus. Die Bilder von Anke Jungbluth, 1967 in Aurich geboren, überraschen durch eine subtile Vielschichtigkeit. Die Fotografin fokussiert ihre Motive nur selten direkt, sondern nimmt sie als Spiegelung wahr und auf. Dadurch entstehen semitransparente Überlagerungen, die die einzelnen Bildgegenstände in einen neuen räumlichen und ungewohnten Kontext stellen. 1986 in Nürnberg geboren, ist Marcel Teske ein vielversprechender Nachwuchskünstler, der zur Zeit noch an der Udk (Universität der Künste) studiert. Seine Zeichnungen widmen sich der sozialen Komponente urbanen Lebens. Sie zeigen Berliner Menschen in typischen Alltagssituationen. Seine Figuren sind „überzeichnet“, um deren Charakter und Seelenzustände freizulegen, ohne jedoch dabei die Grenze zum Cartoon zu überschreiten. David Antonides, 1958 in Whitehouse (Kanada) geboren,lebte u.a. in Vancouver, New York und London. Seit 2010 hat er sich in Berlin niedergelassen. Als Kosmound Metropolit ist die Großstadt zum Gegenstand seiner künstlerischen Auseinandersetzung geworden. Von flirrender Unruhe erfasst, verschmelzen Menschen und Architektur in seinen Bildern zu einem unentwirrbaren urbanen Organismus. Marcel Teske1986 in Nürnberg geboren, ist Marcel Teske ein vielversprechender Nachwuchskünstler, der zur Zeit noch an der Udk (Universität der Künste) studiert. Seine Zeichnungen widmen sich der sozialen Komponente urbanen Lebens. Sie zeigen Berliner Menschen in typischen Alltagssituationen. Seine Figuren sind „überzeichnet“, um deren Charakter und Seelenzustände freizulegen, ohne jedoch dabei die Grenze zum Cartoon zu überschreiten. In the first exhibition of the GASAG art space , we present three Berlin-based artists who approach the issue in different ways " Berlin and urban life ." Under the title "Trans Metropolis" , we present a visual transit through the middle of the big city - beyond the tourist routes and post card designs . There are passages frequented millions of times, the stations of the tram , the S- and U -Bahn , the little side streets with tenement houses , but also the intimate corners of urban life. David Antonides , Anke Jungbluth and Marcel Teske show the viewer their subjective view of a personal walk through Berlin. Here, previously unseen perspectives open up , cast up the surprising highlights of the city. The artists present Berlin as an open city that always reinvents itself making it difficult to merge all to a common denominator. Thanks to Stiftung Starke for the invitation to exhibit in the Löwen Palais this year. With 6 meter ceilings, interesting detail and a curious vibe, this is a great venue for large paintings. The opening is this Friday at 8 pm. and will show until the end of January. Wie jedes Jahr, veranstaltet die Stiftung Starke auch 2013 ihre große Weihnachtsausstellung gemeinsam mit ihren Künstlern. Der kunstinteressierte Besucher erhält einen Überblick über die verschiedensten Kunstrichtungen, ob Minimalismus, Photographie, Konzeptkunst, Gegenständliche Kunst oder Video.